With the date fast approaching, your son or daughter has finally knuckled down in their Hebrew classes and has learned enough to read from the Haftarah. Every family’s Bar Mitzvah or Bat Mitzvah is a little bit different, but some things always remain the same. Nobody could be more proud of our new young adults. Family and friends have gathered, and after the reading in the temple, it’s time for everyone’s favorite part: the party! 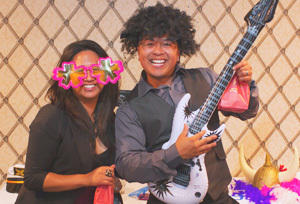 And nowhere are our photo booths a bigger hit than at San Francisco Bar Mitzvahs and Bat Mitzvahs. They don’t quite steal the show, but they are a big part of the stage, and they are more fun than an infinite number of iPhone photos. And for good reason. Photo booth prints make great souvenirs. Make sure to rent a booth that prints instant photo quality pictures (like all of the booths at A Flying Camera), and your guests will have the perfect party favor. As they pass the photos around the party, they inspire other to go make their own fun, and the photobooth stays one of the most popular activities of the evening. Especially if the DJ tries to bring out the universally hated “hokey pokey” song. Then at the end of the night, your guests can take home their own personalized souvenir to put on their fridge door, and maybe even save. The booths at A Flying Camera actually print two copies of every photo strip, so the guest of honor gets to keep a scrapbook of all the photos from their party, along with written well-wishes from the guests. Many years later, when you look back on this day, your favorite part wont be that folder on your computer full of cellphone pics, it will be the amazing scrapbook full of friends and family In San Francisco, all laughing and having the time of their life together.